UPDATED: Sun., July 1, 2018, 10:08 p.m.
More of Hanford’s newest waste storage tanks could be at risk of developing leaks, according to a new evaluation. Tank farm contractor Washington River Protection Solutions compared the chemistry of the waste in the nuclear reservation’s oldest double-shell tank, which was discovered to be leaking, to the waste in the nuclear reservation’s other double-shell tanks. The evaluation’s conclusion and other findings about the condition of the Hanford Site’s double-shell tanks suggest a need to build more waste storage tanks for 56 million gallons of waste, according to the Washington Department of Ecology. He characterized three of the double-shell tanks that still hold waste as having “very high risk factors” for corrosion, based on information in the new study. 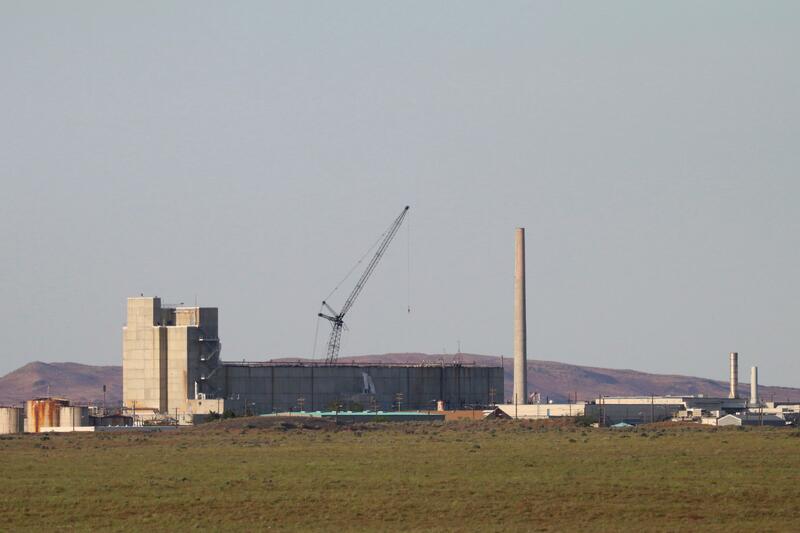 But the finding doesn’t mean the three tanks are leaking or will leak, said Jeremy Johnson, deputy DOE project director for the Hanford tank farms, at a recent Hanford Advisory Board committee meeting. The Department of Energy is emptying the radioactive and hazardous chemical waste from 149 leak-prone single-shell tanks into 28 newer double-shell tanks for storage until the waste can be treated for disposal. The waste is left from the past production of plutonium for the nation’s nuclear weapons program. But the first of the double-shell tanks – Tank AY-102, which dates to 1971 – has been taken out of service and emptied after developing a slow leak from its inner shell into the space between its shells. Initially, officials suspected the leak was caused by construction problems, including welds that had to be reworked as many as four times. But an inspection in 2017, after most of the waste was retrieved from the tank, found widespread pitting on the bottom of the inner shell, allowing waste to seep through. The finding pointed to a corrosion problem. Now the new study finds three other of the double-shell tanks – AY-101, AZ-101 and AZ-102 – have held waste with similar chemistry to what’s suspected of corroding the bottom of the inner shell of Tank AY-102. Among the issues with the three tanks, as well as the tank that leaked and has been emptied, is a history of holding waste that generates high heat, which could accelerate corrosion. The waste chemistry is one of three potential problems in the 27 remaining double-shell tanks that Johnson discussed with advisory board committee members. Two of the tanks with possible waste chemistry issues also have spots with thinning in a ring around the wall of the inner shell. The ring is where condensate, or water from ventilation systems in the tank farms, was added and interacted with the air before it mixed into the rest of the waste. In addition, ultrasonic testing has found thinning of the steel in the bottom of the outer shell of nine of 11 of the double-shell tanks checked. In one spot of Tank AP-102, the steel bottom of the shell had thinned up to 70 percent, according to DOE. Experts don’t know enough about the issue yet to tell if the thinning is recent or definitely say what caused it. However, DOE suspects that moisture may be infiltrating and corroding the outside of the tank where it sits underground on a concrete foundation. The foundation has drains to a sump system. DOE has relied on an independent Tank Integrity Expert Panel, which met last week, to provide recommendations on the Hanford tanks. The panel has “found areas of interest in time to take action before they become a problem,” Johnson said. But the state is concerned that double-shell tank space already is in short supply, with several of the tanks at risk. Every double-shell tank that fails will take two out of use – the one that failed and the one that is filled with waste from the failed tank, Lowe said. Double-shell tanks have a capacity of at least 1 million gallons. DOE has said that once the vitrification plant starts turning low-activity radioactive waste into a stable glass form, as soon as 2021, about 12 million gallons of space will be freed up during the following decade in the double-shell tanks to empty more single-shell tanks. But by the time the vitrification plant starts treating waste, the oldest of the double shell tanks will already be 50 years old. And some of the tanks will remain in service as the plant operates for another 40 years, Ecology officials pointed out. One of the tanks identified as at high risk for corrosion, Tank AZ-101, holds waste that is expected to be treated as high-level radioactive waste, according to Ecology officials. The waste is expected to remain in the tank until 2036, when the vit plant is expected to be fully operational. The Tank Integrity Expert Panel discussed the new study on tanks at risk of corrosion this week, and members said they were concerned that it underestimated risk, according to the Department of Ecology’s account of the meeting. The study did not consider that multiple risks, such as waste that generates high temperatures and waste with certain chemistry, could be synergistic, creating faster corrosion than predicted, according to Ecology. DOE and its tank farm contractor are taking steps both to prevent further deterioration and to learn more. A chemistry-control program for the double shell tanks will be revised, DOE said. Core samples will be collected to analyze the waste at the bottom of the three most at-risk tanks. To prevent pitting in a ring around tanks from ventilation system condensate, the liquid now will be treated elsewhere at the nuclear reservation, rather than going into the tanks. DOE also is evaluating ways to prevent moisture from collecting under outer shells and is considering whether corrosion inhibitor could be added. New robots small enough to be used in the ventilation spaces between the bottoms of the two shells are being developed and could be used later this year to learn more about the condition of the tanks. There also is a possibility that some repairs could be made on the outer shell. Published: July 1, 2018, 8:58 p.m. Updated: July 1, 2018, 10:08 p.m.